CCX-CKR expressed in malignant melanoma and many other metastatic cancers. 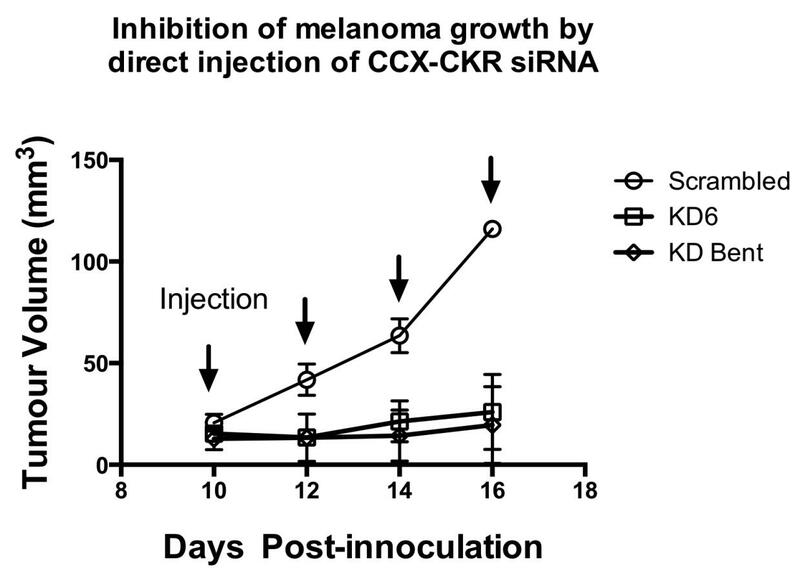 Circumstantial evidence from the literature predicted that interfering with the expression and/or function of CCX-CKR would exacerbate melanoma growth and metastasis. To test this hypothesis, a series of experiments in the B16 murine melanoma model we conducted. 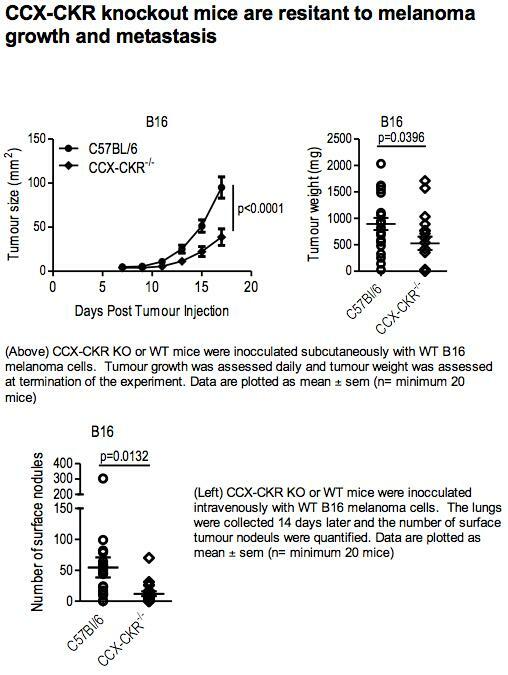 To our surprise, it was discovered that B16 melanoma cell lines in which CCX-CKR has been knocked down by siRNA, while having no effect on cell growth in vitro, are completely rejected in terms of primary tumour growth or experimental metastasis in the lung upon intravenous injection, or metastasis to lymph nodes upon subcutaneous injection. Data suggest that the immune system may exert control over the distribution and volume of melanoma and thus exercise an extrinsic tumour suppressor function. Mechanisms to boost anti-melanoma immune response will be useful in the treatment of both primary and metastatic melanoma. Targeting metastasis critical and CCR7 & CCR9 implicated in metastatic melanoma and many other metastatic cancers. Unlike the chemotherapy drugs presently used, targeting CCX-CKR is a highly specific approach. Unlike other specific targets presently on and coming to market, it is likely to display reduced side effects ? our extensive analysis of CCX-CKR-/- mice indicate that they are phenotypically normal. Early indications are that the more specific drugs coming to market will prove partially effective, targeting only a subset of patients, thus, there will be a continued need for multiple effective therapeutics for metastatic cancer in the foreseeable future to deal with resistance. We are currently seeking partners to continue the development of mono-clonal and peptide CCX-CKR antagonists.